It seems like no matter what time of year it is, noses can get stopped up. Whether it’s from sinus trouble, allergies, or even the common cold, it can be hard to breathe. I’ve used nasal inhalers for these issues in the past, but at nearly $5.00 each, I thought I should try to make my own. It’s actually so easy I’m surprised I didn’t think of it sooner! Cut the fabric into thin strips about 3 inches long and ¼-inch wide. Coil 2-3 pieces into the tube, pushing down with the chopstick. Add the essential oil. Place more fabric on top, pushing down. (I placed the fabric on the bottom for a base for the oil, then more on top so that the essential oil wouldn’t be strong enough to burn my sinuses.) Cap your inhaler and label. Remove cap and inhale into each nostril. Always replace cap after using. 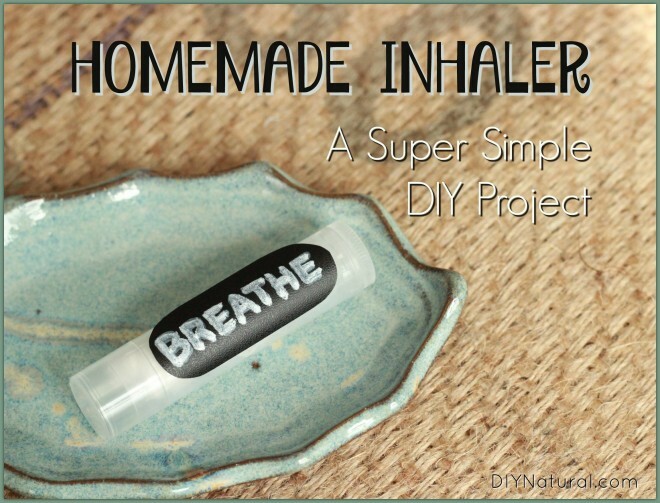 Refresh DIY inhaler with a few more drops of essential oil when needed. Use 5 drops peppermint essential oil for headaches. Peppermint opens up nasal passages and allows more oxygen to the brain, lessening the effects of some headaches. Use 5 drops lavender essential oil for a sleep aid. Lavender calms the brain and body, allowing sleep to come more naturally than using drugs. Use 5-10 drops ginger essential oil to relieve symptoms of nausea. Use 5 drops rosemary oil as a nasal disinfectant. 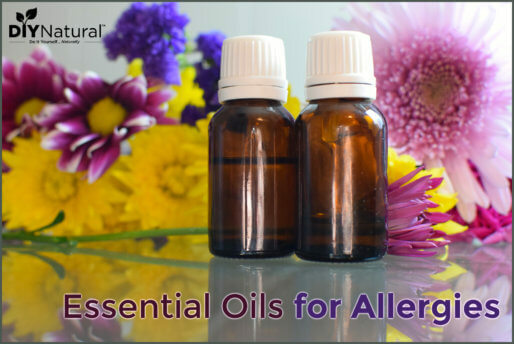 Rosemary essential oil is a powerful germicide and can be used safely in the nasal passages as an inhalant. 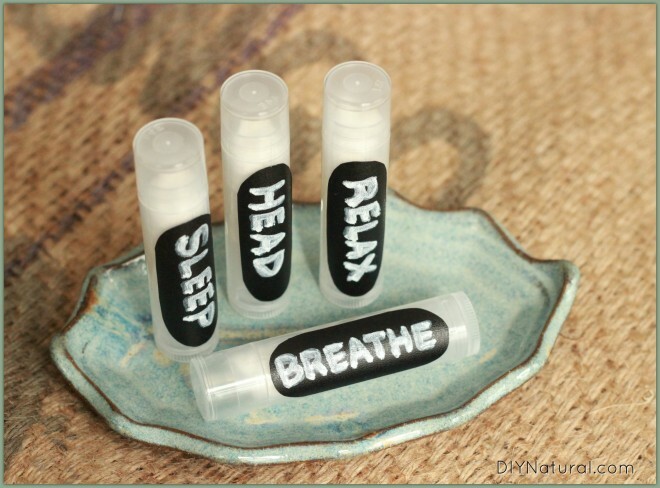 Use 5-10 drops of ylang ylang essential oil to help you relax. Use clary sage essential oil to help to balance hormones. It is thought that clary sage will help restore order to the hormonal system. Use geranium essential oil to help heal canker sores in the nasal passages. 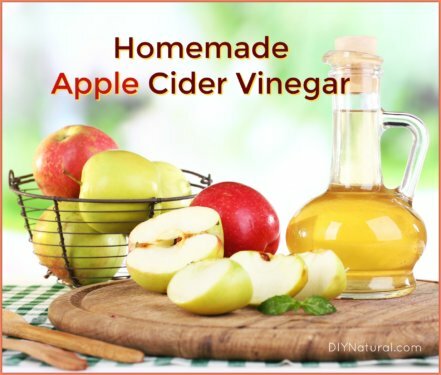 Canker sores and acne can get into the nose and this will help heal them gently. Use 5-10 drops chamomile essential oil to relieve inflammation. Sometimes nasal passages can be swollen, and chamomile can help relieve this. Use 5-10 drops rose essential oil for a dry nose. Rose essential oil has properties that can soothe and soften the inside of your nose. This works very well for when the inside of your nose is dry and cracks, leaving it sore. NOTE: If you try any of these and your nose stings on the inside, it may be too strong for you. 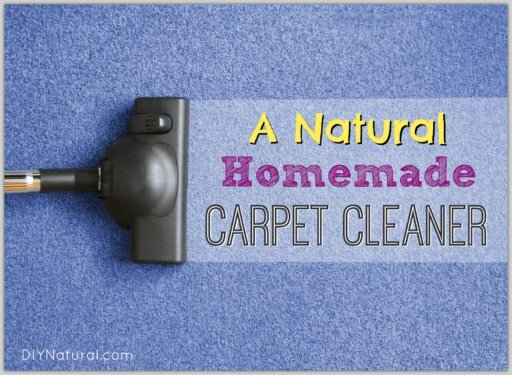 You can try adding more fabric, or you can dilute the essential oil in a tiny amount of carrier oil, such as sweet almond oil. Then stick with only a few drops, as too much can leak out and get into your purse or in your pocket. Could you stuff it with cotton balls? Yes, LaJuanda! 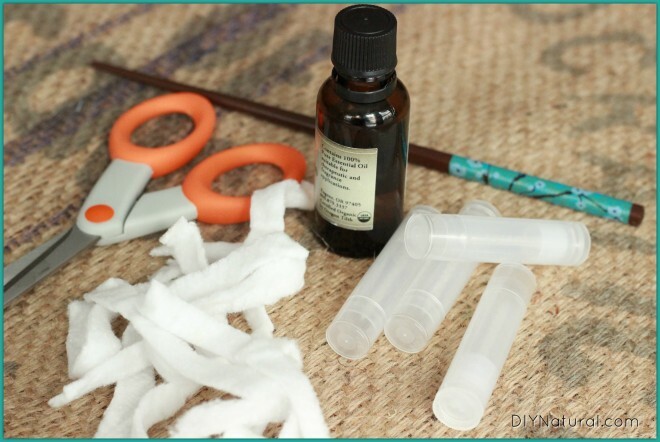 You may want to pull the cotton balls apart a little before stuffing them in the tube. I love these! What a genius idea. I’ll have to try it out next time I use up a lip balm tube.